The amount you are willing to spend on your transcript will dictate how much time you must spend at your end, correcting, amending and finalising the document for print or online publication. We believe that we cannot be beaten on quality, yet we offer a very competitive rate for the service we provide. 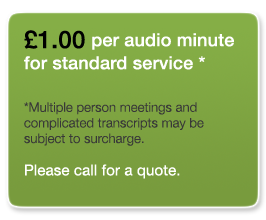 Our speciality is providing a quality transcription service at any volume. We turn around any volume of work within a reasonable time, whilst maintaining the very highest quality standards. All our work is carried out in the UK by well-educated, handpicked professionals. The quality of a Good to Go Transcript will never drop off due to volume of work. Our staff's working vocabulary is second to none, able to deal with complicated, professional fields of work with precise accuracy - and this is not the end of the process. A transcript must be set out correctly, formatted to the requirements of the customer (be it for import into computer software, or for speedy publication), and completed within an agreed timescale.